In this Part we will explore the meaning of the 26th Shloka of Sri Vishnu Sahasranamam. Sobhanah prasAdha dAtrutvAt suprasAdah – For those who surrender to Him He confers all that is good. Sri Adi Sankara says ‘Shobhanah Praasaadah yasya apakaaravataam api Shishupaalaadeenaam Mokshapradaatrutvaat iti – He is the bestower of great gifts to even those who try to oppose him like Shishupaala by giving them the benediction of liberation’. Bhagavan’s gifts are always for the good of the recipient. This concept is reiterated by Vedanta Desikar in the Daya Shatakam when he describes the Daya or compassion aspects of the different incarnations. For instance, in the Parashu Rama incarnation, when He destroyed the evil Kshatriya Kings, He really got rid of their sins, and sent them to the path of liberation. In the Kalki incarnation, when HE will destroy those at the end of the Kali Yuga who are soaked in sin, it is only to wash them of their sins and re-establish the Dharma-oriented Satya Yuga where their individual souls can flourish again that this act of His is undertaken. The writer in Dharma Chakram points out that there are very few of us who will do good to those who are bad to us, in addition to the majority who follow the rule of an eye for an eye, and worse still, there are those who do bad to those who are good to them. Bhagavan is one who does always what is good for everyone irrespective of how they are towards Him. Meditation on Lord Vishnu with this quality implied by this name will give us the right frame of mind to follow the Satvic path. 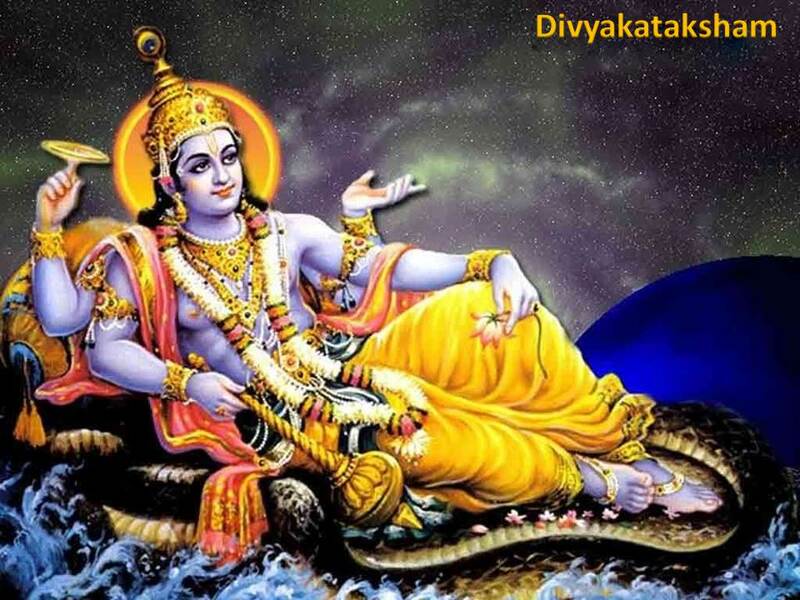 The legend of Putana and Krishna is narrated in many Hindu texts like Bhagavata Purana, Harivamsa (part of Mahabharata), Brahma Vaivarta Purana, Vishnu Purana, Garga Samhita and Prem Sagar. Garga Samhita and Brahma Vaivarta Purana further tell of the previous birth of Putana as Ratnamala, the daughter of demon King Bali. 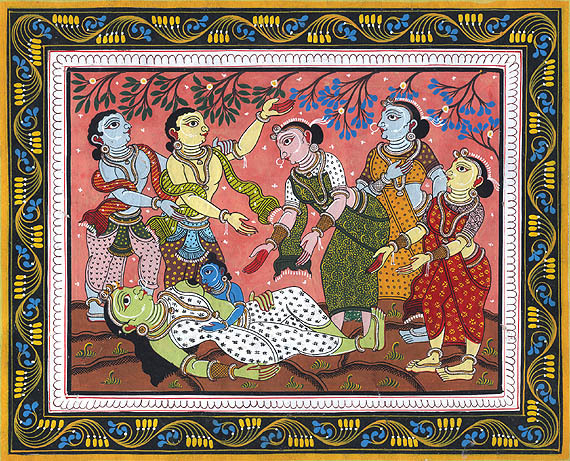 When Ratnamala saw Vamana, one of the previous incarnations of Krishna as a dwarf, she felt a desire to have him as her son and suckle him. However, upon seeing the Trivikrama avatar, she changed her mind and decided to kill Vamana, as he acquired all possessions of King Bali. Krishna knew of her desires and allowed her to fulfil both of them – to suckle him and to attempt to take his life in her next birth as Putana. Putana (also called as poothani), the “killer of infants”, was sent by King Kamsa to kill Krishna. Putana assumed the disguise of a young, beautiful woman and came to Gokul (Vraj) – Krishna’s home-town. Her beauty resulted in her being mistaken bygopas (cowherds) as a manifestation of goddess Lakshmi. Stunned by her beauty, Krishna’s foster- mother Yashoda allowed Putana to take the infant Krishna in her lap and suckle him. Putana had smeared her breast with a mandana, an intoxicant, to kill Krishna. However, Krishna sucked her life (prana), as well as her milk. In pain, Putana screamed, pleading for her release, but in vain. She ran out of the town with Krishna still clinging to her and finally fell dead. The people of Vraj cut Putana’s body, burying her bones and feet and burning the flesh and skin. The fragrant smoke rose out of the flames, as Putana was cleansed of all sin by breast-feeding Krishna and she attained Moksha. Thus, Putana, like Yashodha, is also considered as a foster-mother of Krishna as she breast-fed him. It’s important to note that the circumstances of Putana resulted in her thoughts being constantly engrossed in the Supreme being, she was united with the Krishna. The Lord bestows a heavenly and exalted station even upon those whom he slays in his displeasure. The word ‘prasanna’ means clarity, transparency and charm. In the very first Dhyana shloka we saw the phrase ‘Prasanna vadanam dhyaayet’ is used to describe Bhagavan who has a charming face. Sri Adi Sankara gives the following detailed explanation for this name. 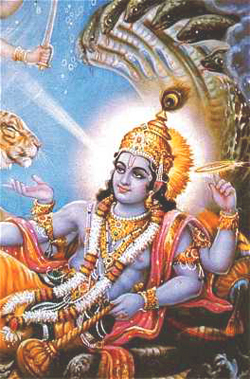 ‘Rajas Tamobhyaam Akalushita Aatmaantahkaranam asya iti Prasannaatmaa – His nature is unpolluted by Rajas (passion) and Tamo (Inertia) Gunaas hence he is Prasannaatma’. He is Prasannaatma because His mind is not contaminated by passion (rajas) and inertia (tamas). Sri P.B. AnnangarAcharya Swami points out that Bhagavan has a clear mind because He is unaffected by likes and dislikes. Swami ChinmayAnanda gives the interpretation that He is All-Blissful because He is not affected by sorrows resulting from association with matter and its imperfections (Gunas). He is of a clear mind, without being affected by the tamasic and rajasic gunas. The Dharma Chakram writer gives the example of the three brothers, Ravana, Kumbhakarna, and Vibheeshana, respectively dominated by rajasic, tamasic and sattvic Gunas. Ravana was indulging in non-righteous acts under the influence of passion and brought self-destruction as a result while Kumbha-karna was inactive under the influence of tamas. Vibheeshana, on the other hand, had the clarity of mind aided by his sattvic Guna. 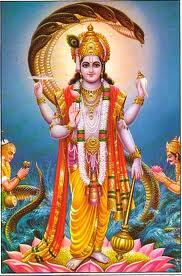 He could save Lanka from destruction and could attain the grace of the Lord because of his clear thinking. Meditating on this Nama will lead to the clarity of mind. Bhishma advised Duryodhana, prior to the start of the MahaBharata war, that they won’t win a war fought on immoral and unethical grounds, and the support of the Lord will always be on the side of Dharma. Prasannaatma emerges out of the dominance of sattva Guna. The basic meaning is ‘Vishvam srijati iti Vishvasrik – he is called Vishvasrik because he creates the Universe’. Sri Adi Sankara gives this name as ‘Vishvadhrik’ meaning ‘Vishvam Dhrishnoti – one who oversees the cosmos’. In this context the writer of Dharma Chakram says that if we learn to rule over our mind, then we can rule our family, our nation, etc., and also know the Ruler of everything. And we get this conditioning of our mind through meditation on the Lord who is Vishva-dhrik. There is also another version ‘Vishvasrisht – also meaning the creator of the Universe’. Sri Satyadevo Vashishtha gives the meaning based on the root dhrish praagalbhye to be bold, confident, proud, or brave. He is Vishva-dhrik because He has created this world with skill (chaturya), prouldy, boldly. Everything He has created, including the different seasons, the flowers, the different forms of life, etc., are constantly displaying His brilliance in the different ways they reproduce themselves, the different forms in which they appear, etc. Sri Parasara Bhattar interprets this phrase as one Nama, whereas Sri Adi Sankara interprets it as consisting of two Namas, viSva-bhuk and vibhuh. 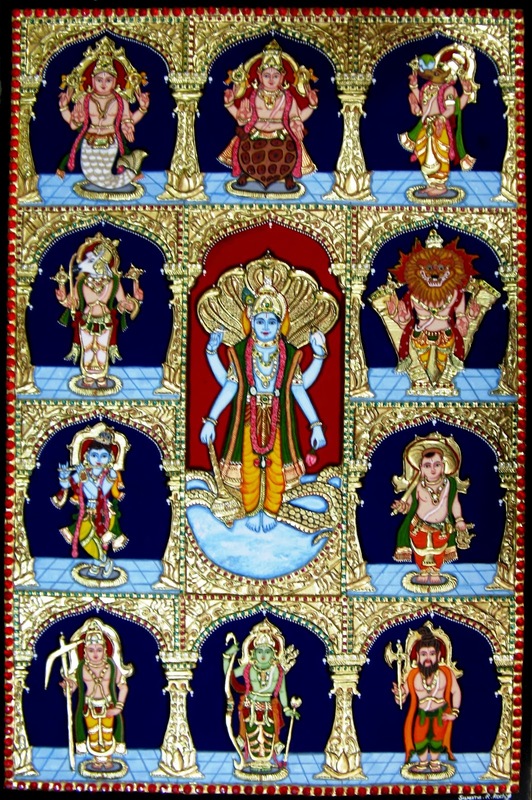 The interpretation for Vishvabhuk is given as viSvam bhunkte – The Enjoyer of the Cosmos, or ViSvam bhunakti – The Protector – vyApya bhunakti – pAlayati iti viSvabhuk-vibhuh. He pervades everything and protects them taking many Vibhutis or forms. According to Sri Adi Sankara this Nama has two meanings. One is ‘Vishvam Bhungte Bhunakti – One who enjoys the Universe’. For him the Universe is a part of his Leela and so He enjoys it. The other meaning is ‘Vishvam Paalayati iti Vishvabhuk – One who protects and nurtures the Universe’. Sri Sankara explains Vibhuh as ‘Hiranyagarbhaadi roopena vividham bhavati iti vibhuh – He took a variety of forms starting from the form of Hiranyagarbha the primordial being’. Swami ChinmayAnanda gives the interpretation that He enjoys or swallows (bhuk) all experiences (viSva). The Supreme Consciousness, apparently conditioned by the mind and intellect, is the experiencer of joys and sorrows. Or, the term can mean “One who absorbs all names and forms unto Himself at the time of pralaya”. Sri Radhakrishna Shastri gives the reference to Taittiriya AraNyaka 10.91 – prabhuh prINAti viSva-bhuk meaning HE protects the Universe. He further says that Bhagavan is Vibhuh because He fills everything everywhere – mahAntam vibhum AtmAnam from the Katha Upanishad 2.22. Sri Satyadevo Vasishtha gives an alternate interpretation based on bhuj kautilye to bend, to curve, and says that the Nama can mean that He established the world by bending or extending it in all eight directions. The Dharma Chakram writer points out that He is the Protector for the Universe in its manifested form with all its created beings or in its unmanifested or pralaya form as well. He elaborates further on the multi-form by giving reference to the Bhagavad Gita Chapter 10 verses 21 to 38 where the Lord gives several examples of His VibhUtis, and then says in Verse 40 that there is really no limit to His VibhUtis. Meaning: O’ mighty conqueror of enemies, there is no end to My divine manifestations. What I have spoken to you is but a mere indication of My infinite opulences. As Adi Sankara puts it ‘Satkaroti poojayati iti Satkartaa’ – One who adores those who are good and wise. Satkaaram is doing honour and worship. 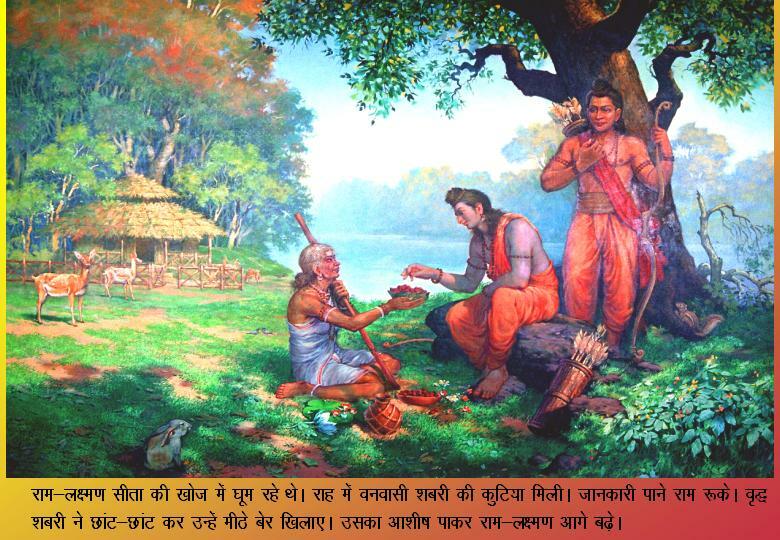 Lord Rama was exemplary in recognising and respecting good people. He was known as sajjanaprati poojakah – He who worships those who are good to Him. Sri Radadhakrishna Shastri gives the reference to Ramayana – ‘Bahu-Srutaanam vriddhaanaam brahmanaaanaam upaasitah (2-2-33) – He worships the learned, the aged, and the Brahmanas. There are several instances where Bhagavan, as Krishna incarnate, accorded great respect to deserving people like Bhishma, Vidura and Kuchela. The writer in Dharma Chakram points out the example of Lord Rama praising Hanuman as soon as He saw him. The Lord rejoices when he finds such people. The lesson we should take from this name is that we should do acts that will make us fit for this kind of recognition. Acts that fall in this category are those that give peace of mind and inner happiness to the doer. On the other hand, we should desist from acts, which lead to a feeling of self-centred accomplishment, pride, etc. Our acts should be directed to His service, and not for the gratification of the human ego. In the words of Sri Adi Sankara ‘poojitairapi Poojitah Satkritah’ – He is worshipped even by those who are themselves fit to be worshipped’. The word Satkritah means poojitah – One who is worshipped. This is complementary to Satkartaa which is the previous name. He is the Object of worship for everyone. The nirukti summarizes Shri Bhattar’s explanation for this name as archaadibhih sajjanaih yah Poojitah Satkritah Smritah. Prof. SrInivasa Raghavacharya Swami in his commentary in Nrisamha Priya points out that when the Ekantins who worship only MahaVishnu make their offerings to Him, no matter how small the offering is, He considers it big by considering it as worthy of His Supreme Status, and receives through His head what is offered at His feet, and receives it personally and not through other intermediary gods. As if this is not enough, He then feels that whatever He does to His devotees is inadequate in return (recall Lord Krishna’s feeling of being indebted to Draupadi for ever when she cried out for help and He helped her but did not in person right away). The Dharma Chakram writer points out that as a means of developing this devotion to Him, our Vedas ask us to worship our mother, our father, our teacher – Maatru devo bhava, Pitrudevo bhava, Acharya devo bhava. Sri Adi Sankara gives the first meaning as ‘Nyaaya pravrittatayaa Sadhuh – One who acts according to justice’. He is very fair and just in his treatment of all persons. He is impartial and follows the laws of justice strictly without any bias. The lesson to take here is, as mentioned in Dharma Chakram, that we should always follow the righteous path in whatever we do, and this will not only endear us to Lord Vishnu, but will also lead to success in our just endeavours. The second meaning is ‘Saadhayati iti Saadhuh – One who carries out or accomplishes what he sets out to do by doing whatever it takes. In the Mahabharatam he plays the role of a charioteer and a messenger to assist his devotees. Even though Lord Krishna was Himself a King like Duryodhana, He did not mind doing the work of a messenger, nor did he mind doing the work of a charioteer which is like that of a servant to Arjuna. Thus, Sadhu here refers to His act of carrying out whatever He has to do to take care of His devotees. He takes various avataars such as a fish, a boar, a lion, a tortoise etc. to protect the world. He undergoes suffering and misery as in the case of the Rama incarnation, all because He is a Sadhu, who carries out what He has to in order to help His devotees. The third meaning is ‘Sadhnoti iti Saadhuh – Makes it possible for devotees to achieve their goals’. Depending on the desire of his devotees whether they want Dharma, Kama, Artha or Moksha he makes it possible to achieve their objectives. This Nama is derived from the root hA – tyAge to forsake. Abhakteshu Atma-mAhAtmyam apahnute iti jahnuh. jahAti avidushah jahnuh is another derviation for the same meaning – He leads those devoid of devotion away from the Supreme. Sri Adi Sankara explains this as ‘Janaan samhaara samaye apahnute apanayati iti Janhuh – He is the terminator of all living beings at the time of the final dissolution’. Sri Sankara also gives the other meaning ‘Jahaati avidushah bhaktaan nayati parampadam iti vaa- He leads the devotees towards the state of liberation and keeps the ignorant away from it’. This concurs with Sri Parasara Bhattar’s interpretation that ‘He leads those devoid of devotion away from the Supreme’. Sri Radhakrishna Shastri gives the incidence of Sage Jahnu who hid the Ganges when Bhagirata brought Ganges (JaahanavI) to the Earth. 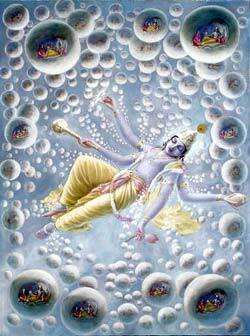 Similarly Bhagavan hides the Universe during Pralaya into Himself, and so He is Janhuh. In Dharma chakram, we find a description of how His act of hiding some things from us is really devoted to helping us in our day-to-day life until we can really realize Him. Thus it is for our benefit that we forget some of our bad experiences of the past, and do not know in advance the future incidences in our life. Shri Satyadevo Vasishtha starts with the root haa tyaage to give up and interprets the name to mean that He is Janhuh because He is devoid of the defects such as kama, krodha, lobha, moha, mada, and maatsarya, and is Shuddha svaroopa. Ganges is Jaanhavi because Ganges washes away the sins. All the previous Namas referred to Naaraayana through His other incarnations or through His many Gunas. This Nama unlike the other Namas in Vishnu Sahasranamam uniquely refers to Maha Vishnu and to no other God. “Whatever object there is in the Universe that is seen or heard, Naaraayanah fully pervades all that, both inside and outside”. Sri Bhattar gives several references to bring out the greatness of this name. Sri Adi Sankara says Nara refers to Atman; Naara refers to ether and the other effects produced from it; He, as their cause, pervades them and they are thus His abode (ayana). Hence He is named Naaraayanah’. He gives the following verse from MahaBharata to support this. Sri Sankara gives another interpretation for this name as ‘Naaraanaam Jeevaanaam ayanatvaat pralaya iti vaa Naaraayanah- The living beings resort to him and take shelter in him at the time of Pralaya or the Deluge’. This is supported by ‘yat pryantyabhisamvishanti’ – Whom they approach and enter – Taittiriya Upanishad 3.1. He is Naaraayana since He is the seat of the Naaras or the tattva-s – nArANAm ayanam yasmAt tasmAn-nArAyaNah smritah – brahmavaivartapurANa. It is interesting to note that this third interpretation is that He is their seat, whereas the first interpretation was that they are His seat. 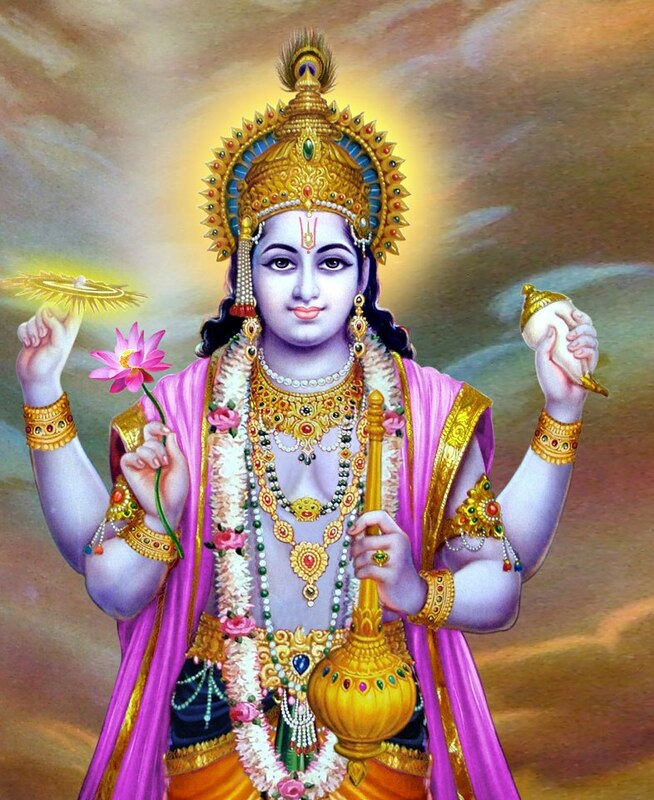 He is the Cause and He is the effect – Savam Vishnu mayam Jagat. Sri Satyadevo Vasishtha draws the parallel between the world being born out of the waters in which Naaraayana is floating, and the child that is born out of the mother’s womb after being supported by the waters in the mother’s body. “This is the real mantra that destroys the deadly poison of Samsaara – Naaraayanaaya namah. This I proclaim loudly with uplifted hands; let the ascetics, with passions curbed and intellects clear, listen to me”. Shri Radhakrishna Shastri reminds us that the mantra-devata that we worship through the Gayatri mantra is Shriman Naaraayana – dhyeyah sadaa savitrumandala madhyavartee Naaraayanah –Naaraayana occupies the center of the solar halo and should be meditated on at all times’. – “nalam tarum Sollai naan kandu konden Naraayanaa ennum naamam” to remind us of the greatness of this naama japam. Sri Parasara Bhattar gives the final verdict on this Nama saying that this should be learned from an enlightened Guru rather than read from a script. However in these days not everybody is fortunate enough to have the blessings of a Guru and so should certainly start by reading about it first. But one should remember that no amount of explanation on paper alone can bring out the greatness of this Nama and the true meaning of this Nama can only be realized with guidance of a revered Guru. Sri Parasara Bhattar gives the meaning that Nara refers to one with imperishable possessions, both sentient and non-sentient (both of which are eternal by nature). Sri Adi Sankara Shankara gives the meaning ‘Nayati iti Narah- He is Narah because he leads us’. He quotes from vyAsa – nayati iti narah proktah paramAtmA sanAtanah – Because He directs everything, the eternal paramAtman is called Narah. Sri Satyadevo Vashishtha also starts with the root as nri nayeto lead, and gives the meaning as nayati – One who leads, or nrinaati – One who takes things away. He is Narah since He takes this Universe from kalpa to kalpa through many kalpas. Narah also refers to water or fluid, since this takes things from one place to another as it flows. That there was only water everywhere before creation took place is supported by the following Vedic quote – tama aasIt tamasaagoodham agre’prakritam salilam sarvamaa idam (Rig Veda 10.129.3). The Dharma Chakram writer points out that just as a mother leads a child with the child’s welfare in mind, and does not mind disciplining the child for its own good when the child goes and eats dirt, or the teacher tries to discipline a student who is not learning the knowledge from the teacher, so also Nara, namely MahaVishnu, leads us all for our good even if He has to mete out some punishment occasionally to get our ways straightened out. Bhagavan is Suprasaadah as HE bestows a heavenly and exalted station even upon those whom he slays in his displeasure. HE acts with a clear mind with an excellent disposition and he is Prasannaatma. HE is the creator of the Universe and is both the Cause and Effect. The Lord pervades everything and HE is the protector taking many forms for that purpose. HE honours the good and is worshipped by even by those who are themselves fit to be worshipped. HE conceals his greatness from those who are disbelievers. HE is Naaraayana, the ultimate destination for all souls and HE is the eternal Leader! The audio visual commentary of this Shloka will be uploaded shortly on YouTube. Hari Om Sir! Beautiful story on Putana. I was not aware of these particulars about her, only read about the evil side of her & your way of explaining every Nama of the Lord Vishnu is very interesting. Thank you Sir. Thank you very much Uncle. I love to read about our scriptures & the way you write is very easy for me to follow. I will read about Shabari surely. Hari Om Uncle! Hari om Uncle! The story of Putana is very interesting Uncle, I did not know there were so many details about her. I am gaining a lot of knowledge about our scriptures through you. But can you please tell me what the first image is all about. I don’t know who is in that image with Rama & what is it about. Please let me know Uncle. Thank you Hari Om Uncle!